Gmail.com has been your partner when it comes to email services. Nowadays, important documents, business reports, bank statements, files and messages are sent through emails. These important documents can be saved on your Gmail but it always has the tendency to be wiped out and you can never access them again. Google itself has confirmed that many users have lost their important emails. If you are afraid to lose your important email messages in your Gmail, then you may want to back it up regularly to avoid these kinds of situations. 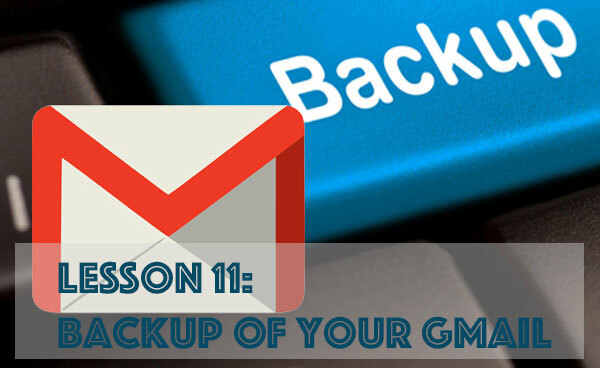 Below are the steps that you can follow when you want to back up your Gmail account. The steps are simple and easy if you will just follow it accurately. Open your browser, log in to your Gmail account. Once the page has loaded, navigate to the top right hand corner and click on Mail Settings. Look for “Forwarding and POP/IMAP” and click on it. Under the POP Download, you will be given several options, click for the first one which is: “Enable POP for all mail (even mail that’s already been downloaded)”. Then, click on Save Changes seen at the bottom pert. Click on Mail Preferences then click on the Accounts tab. Add a new account at the bottom part by clicking the plus sign. On the full name filed, enter your name. In the email address field, enter your Gmail address. If applicable, check the box next to “Automatically set up your account” and click on create account. Open your browser and go to https://www.google.com/settings/takeout and select the data you want to download and then click on Next. Choose your file type, the delivery method and wait for your email. You will receive an email on your google drive with the backed up date already. Install the software at https://code.google.com/p/gmail-backup-com/ and click on Download. After that, open your command or terminal and o to directory of the program. Load and replace d the program, “dir” with the directory name you want to use and your email address with your own password. Go to Tools menu and click on Accounts and click Add, select email account and click on Next. In the From Field of Outgoing Messages, enter your name and click on next. Incoming mail (POP3 or IMAP) server: pop.gmail.com. Google Apps users, enter the server name provided, not your domain name. After that, click on Next and enter your Gmail address and your password, then Click Next. Check the box next to “Do not download my e-mail at this time, then Click Finish. 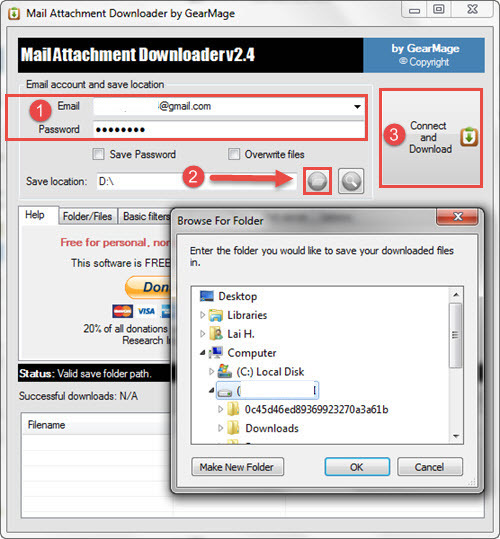 During using Gmail, sometimes you’ll want to download all attachments from Gmail to your PC. However, downloading those attachments one by one will be very time-consuming. So, let’s refer to the tip I’m going to introduce you today to save your precious time when using Gmail. Besides sharing data through file download pages, social networks, email is also another common method of sharing. Users often attach data into mail instead of uploading them on a different page and then send the link to share. Step 3: Log into Gmail by entering your email and password into Email and Password boxes. 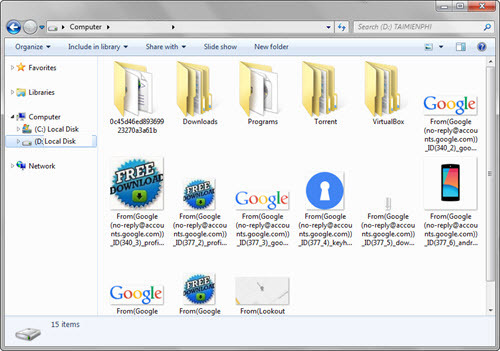 You can also change the path to the folder which will contain all the attachments if you want. Step 4: After clicking on the Connect and Download, the app will require access right to your Gmail. Now, you have to log into your Gmail account to get the code. 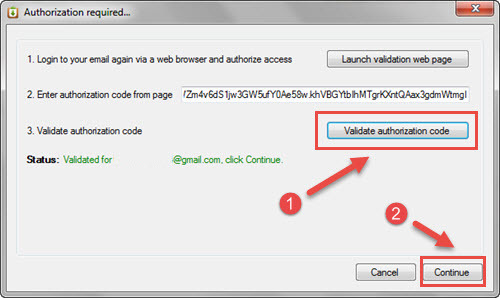 Paste that code into Mail Attachment Downloader then choose Validate Authorization code to confirm. Click Connect and Download one more time to start download. Step 5: Having finished downloading, open the last folder to see all the attachments you’ve downloaded from Gmail. 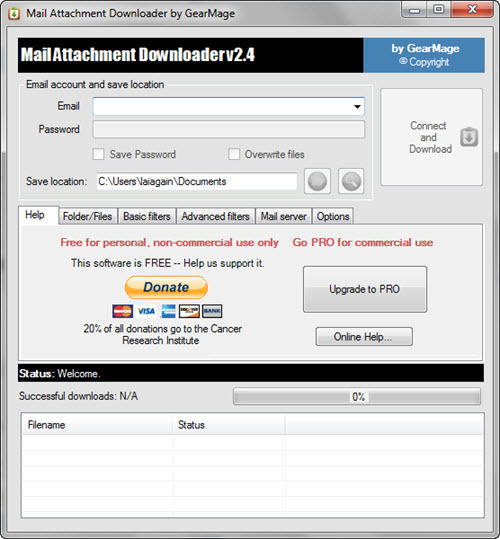 That is the simplest way to download all the attachments from Gmail into your PC, which will help you to save a lot of time. Also, you won’t miss any attachments in Gmail.